Mel and John is a music duo and we are a husband and wife team. We have been in the musical entertainment business for over 30 years. We were co-leaders of an 8-piece band for 25 years that played at private functions all over New England. Our music is an eclectic mix of covers from standards to todays pop hits. We also play some original songs if the venue is conducive to it. Our experience and huge repertoire make us suited to play for any event you can think of. Mel started performing at the tender age of 11. Her parents, both in the hospitality business worked a lot and on almost always holidays. They would bring her and her two brothers to events and they would sing harmonies for tips. (talk about paying your dues). Ultimately, she has been singing ever since. When we stopped running the 8-piece band, she learned to play bass guitar. Now we have evolved into the music duo we are and truly enjoy making music and entertaining audiences. John has been playing guitar since the ripe old age of 9 (don’t know why he waited so long). He has played in numerous bands over the years. He has taught guitar and bass in a variety of music stores. He has been the musical director for all the bands he has played in, as well as this music duo. “I have never had as much fun playing as I am having now”, and it just keeps getting better. 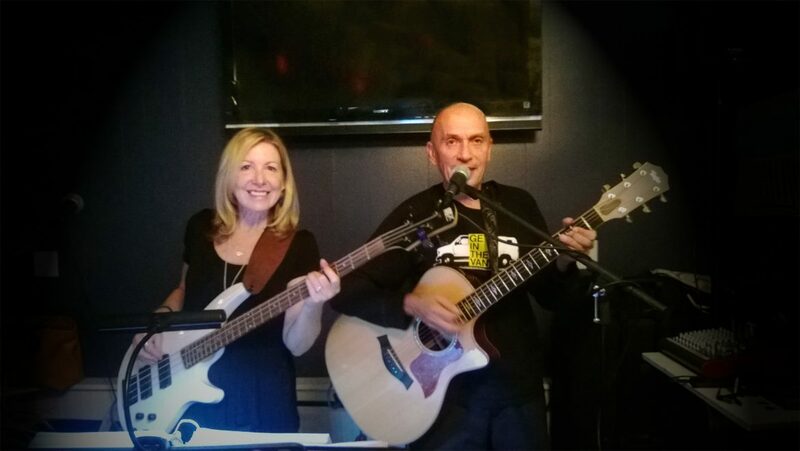 Together, as a music duo, Mel and John have developed a style that is both entertaining as well as musically diverse. We let audiences feel they can sing along with us and let loose, be themselves and have a good time. When people tell us they could never work with their spouse, we both look at each other. We are truly “Living the Dream” and refuse not stop having so much fun.